Do you need your toilet serviced in Phoenix? Once a part of the toilet breaks down or is too worn out , it will hamper total operation and cause toilet malfunctions including water vapor (condensation on the tank), plugged drains or overflowing. You don't realize how much you love your toilet until you don't have one that works. Our Phoenix plumbers can find the problem and provide a solution to get your toilet functioning again. When you discover that your floor is wet every time water is flushed, the problem is most likely the wax bowl ring (located at the foundation of the toilet). 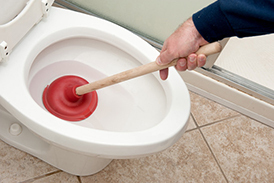 Changing a wax seal involves removing the toilet from the floor. D.I.Y buffs should really leave this job to the Option One plumbing professionals in Phoenix. Should you give it a try, start with disconnecting the water supply, loosen the screws that anchor the toilet to the floor, put in a new wax bowl ring and place the toilet over the screws. Replacing the wax bowl ring is also required if the toilet wobbles back and forth. This "wobble" is result of improper seating on the wax ring or it's an indication of the wax ring breaking down. Not only will the toilet leak but it will allow sewer gases into the home or business. If you smell sewer gases, you most likely have a wax ring that needs to be replaced. Blocked toilets or clogs generally means poor flushing performance. If not repaired or addressed, a congested toilet will spill over and flood your bathroom with water. If the clog is tiny, it could possibly be removed with a toilet plunger. If a plunger isn't solving your problem, you can call Option One plumbing and have this service provided at an affordable price. If our thorough snaking does not unclog the toilet, we will check the drain pipes for the blockage and make any necessary recommendations. 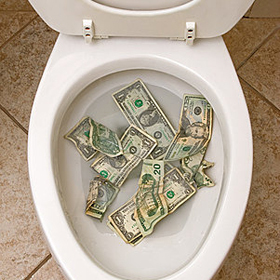 You can count on us to quickly unclog your toilet with full disclosure of price, and never at an unnecessary cost to you. Clogs are usually the cause of poor flushing. Left unserviced, a clogged toilet will be very hard to flush causing it to overflow and the possibility of flooding your bathroom floor with raw sewage. A light obstruction can be removed with the use of a normal household plunger. In some cases, if the obstruction is too large, a plunger will not be strong enough to unclog your drain. Call your Option One plumbers in Phoenix... we can unclog your toilet, fast, efficiently and have it working quickly! Steam from your shower or hot water water from your bathroom sink can cause your toilet bowl to drip. Once oxygen in the bathroom is of a higher temperature than the temperature of water within the bowl, condensation will occur and generate a perspiring toilet. 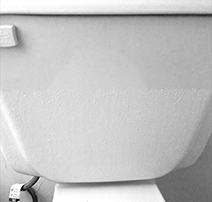 If not repaired, a "sweaty" toilet bowl can be a place for fungus to grow in the bathroom. If you are concerned about your toilet and the safety of your home, Option One Plumbers in Phoenix are here to help. Friendly, courteous, clean and honest. Give us a call... your satisfaction is guaranteed! Does Your Phoenix Toilet Constantly Run Or Leak? Just as running or leaking toilets are money and water wasters, any leaking fixture in your house should be repaired to avoid costly home repairs in the future. Call Option One plumbing in Phoenix for prompt water leak detection and quick repair. In addition to toilet repair services, we can also perform toilet installations or replacement service in as little as several hours for most clients. With our toilet replacement and installation services, we can install low-flow or high-efficiency toilets to replace older toilets or install new toilets during construction or renovation projects. New low-flow toilet designs are more efficient than older toilets, using only 1.6 gallons but still offering the same flushing power. Our professional plumbers in Phoenix are here to help you with any toilet installation you need. If you need a toilet installed, look no further than your local Option One plumber. Option One Plumbing are expert toilet plumbers in Phoenix. You can count on us to quickly fix your toilet, make repairs as necessary with full disclosure of price, and never at an unnecessary cost to you. Fast, affordable and honest plumbers in Phoenix, that is Option One. We offer a full range of plumbing services. Whether it is a small job or a large job, our technicians are fully trained and available, 24 hours a day. We offer free estimates on all replacements or installations. Our experienced plumbers can also address any other plumbing problems in Phoenix you might have. Such as: Water leaks, gas leaks, garbage disposal service, drain and sewer issues, faucet repairs and installation, and Phoenix low water pressure issues.